There once was a tiny alien, with a very big job...Alien was a star shiner. Holly and Lara were both transported into magical sparkly space when I first read them this book; their eyes were wide open. Can you imagine having to shine all of the stars in the universe? Can you imagine if all of those stars suddenly stopped shining? Wow. 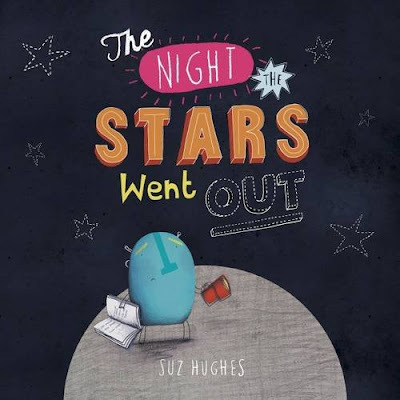 The Night the Stars Went Out by Suz Hughes is the tale about the biggest problem that this tiny alien has ever had to solve. The girls couldn't believe it! This delightful picture book follows poor little alien down to planet earth in search of special star shining varnish. Down on planet earth, the alien makes a new friend (star shining is a very lonely business normally) and discovers that there is more to life than shining stars. It really put a smile on my own face as we reached the end of the story and discovered that fun and friends, not special star shining varnish, were all that was needed to save the day! This fun and friendly picture story book by Suz Hughes is published by Curious Fox and features bright, bold illustrations with lots of alien fun. We particularly loved the illustrations of the dark night sky with a rollercoaster path down to planet earth. Alien has very cool eyebrows and a very groovy moustache - it would be quite hard not to want to be friends with him! I'd recommend The Night The Stars Went Out for children of about 2-7 years old - it makes a fabulous warming story just before bedtime.